My understanding is that a motion already submitted to the House and rejected cannot be resubmitted in the same session, so there will have to be some creative framing to get this in the House again. I seem to recall also writing somewhere, or perhaps telling someone, that there was a procedural way round this block. Mrs May, as prime minister, could ask the Queen to prorogue parliament, thereby ending the session, setting the date for the new session on the same day the old one ends. The Queen would formally summons parliament to attend, and start the new session in the traditional way with a State Opening of Parliament. That perhaps is a bit drastic – there may be other procedural work-rounds – but talk of a constitutional crisis is somewhat overblown. However, it would not be wrong to talk of a political crisis. Nor can it be fairly said, as Downing Street apparently claims, that Bercow is sabotaging Theresa May's efforts to rescue her Brexit deal. If it is truly the case that Downing Street was unaware of this restriction, and is currently in a state of shock, then it points further to a sense of pervasive incompetence in government, about which I remarked in my previous piece. As to the source of this information, it resides in Erskine May, but obtainable to mere mortals only on payment of £439.99 – although it is, of course, free to our rulers. What sort of democracy is it, one might ask, where members of the public have to pay a small fortune to obtain a copy of our parliament's rules, but then it is somehow typical of the way this country is governed that the plebs should be deprived of such information. We also find details of where prorogations have been resorted to in order to circumvent this rule. One period in 1707 lasted a week but in 1721 it was over in a mere two days. In theory, though, there seems to be nothing to stop a prorogation being set for an hour or less, which could – in theory - keep Mrs May's motion on track, ready to be voted on before the European Council later this week. Nevertheless, at the time of writing, plans for today's expected vote are in disarray, with the situation accurately described as "chaos", even if we detach the constitutional aspect from it. The fact is that, since the government intended to offer the same "question", it should have been prepared. It wasn't. With the situation totally fluid, one must assume that the previous calculus has gone by the board. Originally, Mrs May was to give the MP collective the opportunity for another vote, with the intention of then seeking a short Article 50 extension if her deal was ratified. Only if it was rejected for the third time was the prime minister to ask at this week's European Council meeting for a longer extension. Now, theory apart, there seems little chance that there can be a third vote before the European Council, even if a prorogation is settled upon. In practice, I rather doubt whether the Queen could be prevailed upon at such short notice to attend a State Opening of Parliament. Charles could, of course, stand in, but the timetable still looks very iffy. Thus do we find ourselves in an extraordinary situation. With only ten days to go before the scheduled Brexit day, any idea of a roadmap has evaporated. The "colleagues" in Brussels can have no idea of Mrs May's intentions because, most likely, she herself has no clue of what they are. As for us, we not only don't know whether we are going to leave on time, we don't even know what is planned over the next few days. 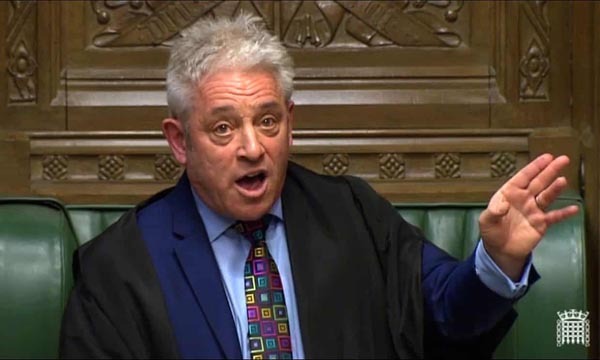 That said, one wonders why Mr Bercow left it to the eleventh hour before making it known, very publicly, that he intended to invoke standing parliamentary procedure. The possibility of a new vote has been on the cards since the end of last week, and the viability of bringing the same deal back to the House ad infinitum was raised by Angela Eagle as a point of order on 13 March - five days ago. At the time, Bercow acknowledged that there were "historical precedents" for the way in which such matters were regarded. He was, he said, "grateful to the hon. Lady for reminding me that such a ruling might at some point in the future be required". Anticipating such a ruling, he could have easily passed word of his intention to Downing Street before the weekend started. When it was raised again the next day (Friday) by Chris Bryant, he cannot really claim that he needed any great deal of time to think about the issues raised. In his statement yesterday, he noted that the convention was "very strong and of long standing". In fact, Bryant had already told him that the ruling had been reasserted by four different speakers, notably in 1864, 1870, 1882, 1891 and 1912. Each time, the speaker of the day ruled that a motion could not be brought back because it had already been decided in that same session. Bercow himself then confirmed that Erskine May made reference to no fewer than 12 such rulings up to the year 1920. They have weight. In many cases, they have direct effects not only here but on the lives of our constituents. Absence of Speaker intervention since 1920 is attributable not to the discontinuation of the convention but to general compliance with it; thus, as Erskine May notes, the Public Bill Office has often disallowed Bills on the ground that a Bill with the same or very similar long title cannot be presented again in the same Session. With the issue so clear, there was no need to delay a ruling and leaving it so late reduces the already short time to crisis level. And as the government runs out of time, it also runs out of options. But, crucially, it gives Brussels perilously little time to react in circumstances where London's problems are relatively modest by comparison. Probably, the only play available to the "colleagues" is to give the UK a short-term extension, for the sole purpose of organising a third and final vote. For that, though, they will need Mrs May's assurances that there is a procedural "fix", which undoubtedly there is. The precedents for a prorogation are sound. Even the speaker agreed that resubmission after prorogation "is self-evidently valid". However, if prorogation takes us into an extension period, it would almost certainly create a make-or-break situation, where a negative vote would precipitate a no-deal Brexit - unless at the last minute Mrs May is prepared to revoke the Article 50 notification. An affirmative vote would take us into the transition period. From this perspective, it would seem that the long-extension option is off the table. Keeping to their current policy stance of refusing a long extension unless there is a "substantial justification", the European Council might find it difficult to authorise anything other than a short period, in the absence of any certainty as to the Westminster parliament's intentions – which now cannot be divined before the European Council. One final possibility, though, might involve the Council deferring any decision and convening an emergency consultation on 29 March. That, literally, would leave it to the eleventh hour – one hour before midnight, Brussels time - maximising uncertainty and creating an intolerable situation. The only thing consistent about Brexit, it now seems, is that just when you think it has got as bad as it can get, it gets worse. On that basis, one fears that the worst is yet to come.